Shannon McNally in the crux of a prolific phase. Earlier this year, she released the highly acclaimed Coldwater, grounded in her love for JJ Cale, classic rock and the juncture where blues, soul and country music meet -- made all the more powerful by the keys of the late, great Jim Dickinson. 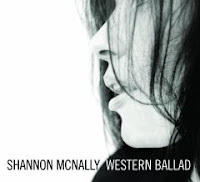 Now, McNally comes forth with Western Ballad, releasing February 8, 2011, anchored by the title track written by Allen Ginsberg. The album was born of a simple woodshedding between McNally and Bingham at his famed New Orleans Piety Street Studios What was born of the session is a collection of songs inspired by themes inherent in the vintage American songbook. It’s not a coincidence the pair, who both were living in New Orleans when Katrina hit, finished the record during the days of the oil spill. The songs contemplate mortality, the unity of the downtrodden the joys of day-to-day life, Native American themes, our part in the natural world, as well as the treacheries of the ego. It became a wayfaring spiritual record, or a spirit-record as she might say -- driven by her sultry, mellow voice. And Ginsberg’s words tied it all together in the end. “It was the missing link,” says McNally. Bingham, A 70s era avant-garde musician and artist who became an in-demand producer-arranger-engineer presiding over countless jazz, rock, pop, blues, zydeco, brass band and hip-hop sessions since relocating to New Orleans, worked musically with Ginsberg for several years, and had done a new arrangement for the piece in the late 80s. He points out “I always wanted to hear a singer who could do it justice.” And from McNally’s perspective the song "was a gift. Allen Ginsberg was one of America's transcendent thinkers and as one of the principal beat era poets, also a principal defining voice of the counter culture- rock and roll has and will always be about questioning authority and knowing oneself. That's been my church." In the beginning I didn’t know where we were going, but I had complete faith in the process,” shares McNally, “Memory of a Ghost” was the first song they finished and is the first single (available on iTunes now). “It is an ode to the world of reflections, where things are backwards and opposite to our everyday world. It’s where instincts and distant memories are what guide a person. I like that state and I feel better if I can stay connected in part to it,” she says of the song. A tambourine punctuates the surreal and Native American landscape of the song with a bridge sung by Bingham that gives the ghost it’s say -- driven by McNally’s lead guitar. Shannon continues to tour with her band Hot Sauce featuring Eric Deaton on guitar (a disciple of RL Burnside and Junior Kimbrough), Wallace Lester on drums, Jamison Hollister on pedal steel, mandolin and violin, and Greg Spradlin on bass and background vocals. She’s spending the end of 2010 touring with the duo Paul Olsen and Mike Mattison, known as the band Scrapomatic. McNally and Mattison got to know each other when she opened and played with Mattison’s other day-job, The Derek Trucks Band.